Here's my post from the Paper Maniac Blog yesterday! First up, we have Brady's Valentines. 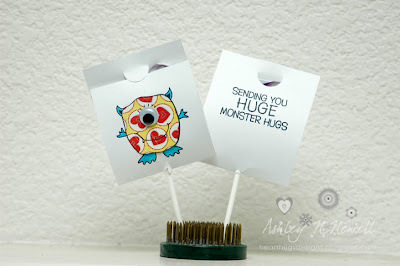 He specifically asked for a monster so I went ahead and made some lollipop covers for him to hand out. Here's a picture that shows the monster on the front and the sentiment on the back. I used a stamp set from Hero Arts to make this. The patterned paper is My Mind's Eye Love Me Do. I added a googly eye and colored his ears, hands and feet with the BG05 Copic marker. I pieced the hole for the lollipop with my Making Memories Paper Piercer. Next up are Parker's Valentines. I'm gonna be honest, I ran out of steam on these! I wanted to make something cute but my mind just isn't working. I'm super tired today. So, I took some small regular mailing envelopes and decorated them. I put chocolate kisses in them and sealed them up. 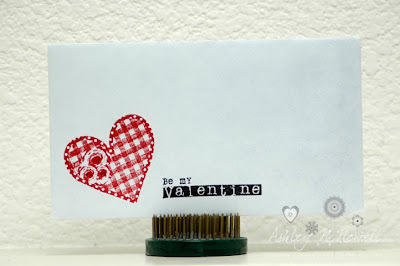 The stamps are Unity Stamp Co Wishes and Kisses and I just added a little Stickles to the roses. It was SO remarkably fast to make 20 of these! Fabulous Valentine's cards, like both of them. Hope you had a wonderful day! How cute is this. No baggie with his name written in sharpie for you! I love this. Very clever!